Welsh (Cymraeg; [kʰəmˈraiɡ] ( listen)) or y Gymraeg (Welsh pronunciation: [ə ɡəmˈraiɡ]) is a member of the Brittonic branch of the Celtic languages. It is spoken natively in Wales, by some in England, and in Y Wladfa (the Welsh colony in Chubut Province, Argentina). Historically, it has also been known in English as "Cambrian", "Cambric" and "Cymric". Of usual residents in Wales aged three and over, 19.0% were able to speak Welsh according to the United Kingdom Census 2011. According to the 2001 Census, 20.8 per cent of the population aged 3+ were able to speak Welsh. This suggests that there was a decrease in the number of Welsh speakers in Wales from 2001 to 2011 – from about 582,000 to 562,000 respectively. The Annual Population Survey conducted by the ONS for the year ending in December 2018 suggested that 898,700 people or 29.8 per cent of people aged three or over in Wales were able to speak Welsh. The results for the most recent National Survey for Wales (2017-2018) suggested that 19 percent of the population aged 16 and over were able to speak Welsh, with an additional 12 percent noting that they had ‘some Welsh speaking ability’. The Welsh Language (Wales) Measure 2011 gave the Welsh language official status in Wales, making it the only language that is de jure official in any part of the United Kingdom, with English being de facto official. The Welsh language, along with English, is also a de jure official language of the National Assembly for Wales. 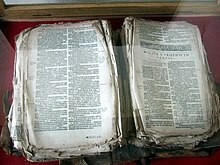 This tattered Welsh Bible of 1620, in Llanwnda church, was rescued from the hands of French invaders in 1797. The language of the Welsh developed from the language of Britons, according to academic T. M. Charles-Edwards. The emergence of Welsh was not instantaneous and clearly identifiable. Instead, the shift occurred over a long period of time, with some historians claiming that it had happened by as late as the 9th century, with a watershed moment being that proposed by Kenneth H. Jackson, the Battle of Dyrham, a military battle between the West Saxons and the Britons in 577 AD., which split the South Western British from direct overland contact with the Welsh. Four periods are identified in the history of Welsh, with rather indistinct boundaries: Primitive Welsh, Old Welsh, Middle Welsh, and Modern Welsh. The period immediately following the language's emergence is sometimes referred to as Primitive Welsh, followed by the Old Welsh period – which is generally considered to stretch from the beginning of the 9th century to sometime during the 12th century. The Middle Welsh period is considered to have lasted from then until the 14th century, when the Modern Welsh period began, which in turn is divided into Early and Late Modern Welsh. The name Welsh originated as an exonym given to its speakers by the Anglo-Saxons, meaning "foreign speech" (see Walha). The native term for the language is Cymraeg: North/Central Wales pronunciation /kɘm'raɪg/, South Wales pronunciation /kɘm'ra:g/. Welsh evolved from Common Brittonic, the Celtic language spoken by the ancient Celtic Britons. Classified as Insular Celtic, the British language probably arrived in Britain during the Bronze Age or Iron Age and was probably spoken throughout the island south of the Firth of Forth. During the Early Middle Ages the British language began to fragment due to increased dialect differentiation, thus evolving into Welsh and the other Brittonic languages. It is not clear when Welsh became distinct. Kenneth H. Jackson suggested that the evolution in syllabic structure and sound pattern was complete by around 550, and labelled the period between then and about 800 "Primitive Welsh". This Primitive Welsh may have been spoken in both Wales and the Hen Ogledd ("Old North") – the Brittonic-speaking areas of what is now northern England and southern Scotland – and therefore may have been the ancestor of Cumbric as well as Welsh. Jackson, however, believed that the two varieties were already distinct by that time. The earliest Welsh poetry – that attributed to the Cynfeirdd or "Early Poets" – is generally considered to date to the Primitive Welsh period. However, much of this poetry was supposedly composed in the Hen Ogledd, raising further questions about the dating of the material and language in which it was originally composed. This discretion stems from the fact that Cumbric was widely believed to have been the language used in Hen Ogledd. An 8th-century inscription in Tywyn shows the language already dropping inflections in the declension of nouns. Janet Davies proposed that the origins of Welsh language were much less definite; in The Welsh Language: A History, she proposes that Welsh may have been around even earlier than 600 AD. This is evidenced by the dropping of final syllables from Brittonic: *bardos "poet" became bardd, and *abona "river" became afon. Though both Davies and Jackson cite minor changes in syllable structure and sounds as evidence for the creation of Old Welsh, Davies suggests it may be more appropriate to refer to this derivative language as Lingua Brittanica rather than characterising it as a new language altogether. The argued dates for the period of "Primitive Welsh" are widely debated, with some historians' suggestions differing by hundreds of years. The next main period is Old Welsh (Hen Gymraeg, 9th to 11th centuries); poetry from both Wales and Scotland has been preserved in this form of the language. As Germanic and Gaelic colonisation of Britain proceeded, the Brittonic speakers in Wales were split off from those in northern England, speaking Cumbric, and those in the southwest, speaking what would become Cornish, and so the languages diverged. Both the works of Aneirin (Canu Aneirin, c. 600) and the Book of Taliesin (Canu Taliesin) were during this era. Middle Welsh (Cymraeg Canol) is the label attached to the Welsh of the 12th to 14th centuries, of which much more remains than for any earlier period. This is the language of nearly all surviving early manuscripts of the Mabinogion, although the tales themselves are certainly much older. It is also the language of the existing Welsh law manuscripts. Middle Welsh is reasonably intelligible to a modern-day Welsh speaker. It can never be destroyed through the wrath of man, unless the wrath of God shall concur. Nor do I think that any other nation than this of Wales, nor any other language, whatever may hereafter come to pass, shall in the day of reckoning before the Supreme Judge, answer for this corner of the Earth. Modern Welsh is subdivided into Early Modern Welsh and Late Modern Welsh. Early Modern Welsh ran from the 15th century through to the end of the 16th century, and the Late Modern Welsh period roughly dates from the 16th century onwards. Contemporary Welsh differs greatly from the Welsh of the 16th century, but they are similar enough for a fluent Welsh speaker to have little trouble understanding it. During the Modern Welsh period there has been a decline in the popularity of the Welsh language: the number of Welsh speakers declined to the point at which there was concern that the language would become extinct. Welsh government processes and legislation have worked to increase the proliferation of the Welsh language, e.g. through education. The Bible translations into Welsh helped maintain the use of Welsh in daily life. The New Testament was translated by William Salesbury in 1567, and the complete Bible by William Morgan in 1588. Welsh has been spoken continuously in Wales throughout recorded history, but by 1911 it had become a minority language, spoken by 43.5 per cent of the population. While this decline continued over the following decades, the language did not die out. By the start of the 21st century, numbers began to increase once more, at least partly as a result of the increase in Welsh medium education. The 2004 Welsh Language Use Survey showed that 21.7 per cent of the population of Wales spoke Welsh, compared with 20.8 per cent in the 2001 Census, and 18.5 per cent in 1991 Census. The 2011 Census, however, showed a slight decline to 562,000, or 19 per cent of the population. The census also showed a "big drop" in the number of speakers in the Welsh-speaking heartlands, with the number dropping to under 50 per cent in Ceredigion and Carmarthenshire for the first time. However, according to the Welsh Language Use Survey in 2013–15, 24 per cent of people aged three and over were able to speak Welsh. The Annual Population Survey by the ONS estimated that, for the year ending in December 2018, 898,700 or 29.9 per cent of the population of Wales aged 3 and over were able to speak the language, without defining to what level of competence, implying a possible increase in the prevalence of the Welsh language since the 2011 census. Similarly, the National Survey for Wales, conducted by Welsh Government, has also tended to have a higher percentage of Welsh speakers than the Census, with the most recent results for 2017-2018 suggesting that 19 percent of the population aged 16 and over were able to speak Welsh with an additional 12% noting that they had some Welsh speaking ability. Historically, large numbers of Welsh people spoke only Welsh. Over the course of the 20th century this monolingual population "all but disappeared", but a small percentage remained at the time of the 1981 census. Most Welsh-speaking people in Wales also speak English (while in Chubut Province, Argentina, most speakers can speak Spanish – see Y Wladfa). However, many Welsh-speaking people are more comfortable expressing themselves in Welsh than in English. A speaker's choice of language can vary according to the subject domain and the social context, even within a single discourse (known in linguistics as code-switching). Welsh speakers are largely concentrated in the north and west of Wales, principally Gwynedd, Conwy, Denbighshire (Sir Ddinbych), Anglesey (Ynys Môn), Carmarthenshire (Sir Gâr), north Pembrokeshire (Sir Benfro), Ceredigion, parts of Glamorgan (Morgannwg), and north-west and extreme south-west Powys. However, first-language and other fluent speakers can be found throughout Wales. Welsh-speaking communities persisted well into the modern period across the border in England. Archenfield was still Welsh enough in the time of Elizabeth I for the Bishop of Hereford to be made responsible, together with the four Welsh bishops, for the translation of the Bible and the Book of Common Prayer into Welsh. Welsh was still commonly spoken there in the first half of the 19th century, and churchwardens' notices were put up in both Welsh and English until about 1860. In one of the earliest works of phonetics, On Early English Pronunciation in 1889, Alexander John Ellis identified a small part of Shropshire as still speaking Welsh, and plotted a Celtic border that passed from Llanymynech to Chirk through Oswestry. The number of Welsh-speaking people in the rest of Britain has not yet been counted for statistical purposes. In 1993, the Welsh-language television channel S4C published the results of a survey into the numbers of people who spoke or understood Welsh, which estimated that there were around 133,000 Welsh-speaking people living in England, about 50,000 of them in the Greater London area. The Welsh Language Board, on the basis of an analysis of the Office for National Statistics (ONS) Longitudinal Study, estimated there were 110,000 Welsh-speaking people in England, and another thousand in Scotland and Northern Ireland. In the 2011 Census, 8,248 people in England gave Welsh in answer to the question "What is your main language?" The ONS subsequently published a census glossary of terms to support the release of results from the census, including their definition of "main language" as referring to "first or preferred language" (though that wording was not in the census questionnaire itself). The wards in England with the most people giving Welsh as their main language were the Liverpool wards of Central and Greenbank, and Oswestry South. In terms of the regions of England, North West England (1,945), London (1,310) and the West Midlands (1,265) had the highest number of people noting Welsh as their main language. The American Community Survey 2009–2013 noted that 2,235 people aged 5 years and over in the United States spoke Welsh at home. The highest number of those (255) lived in Florida. 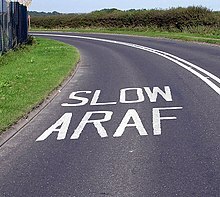 Bilingual road markings near Cardiff Airport. 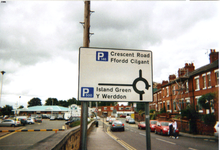 In Welsh-speaking areas, the Welsh signage appears first. Although Welsh is a minority language, support for it grew during the second half of the 20th century, along with the rise of organisations such as the nationalist political party Plaid Cymru from 1925 and Welsh Language Society from 1962. The Welsh Language Act 1993 and the Government of Wales Act 1998 provide that the Welsh and English languages be treated equally in the public sector, as far as is reasonable and practicable. Each public body is required to prepare for approval a Welsh Language Scheme, which indicates its commitment to the equality of treatment principle. This is sent out in draft form for public consultation for a three-month period, whereupon comments on it may be incorporated into a final version. It requires the final approval of the now defunct Welsh Language Board (Bwrdd yr Iaith Gymraeg). Thereafter, the public body is charged with implementing and fulfilling its obligations under the Welsh Language Scheme. The list of other public bodies which have to prepare Schemes could be added to by initially the Secretary of State for Wales, from 1993–1997, by way of statutory instrument. Subsequent to the forming of the National Assembly for Wales in 1997, the Government Minister responsible for the Welsh language can and has passed statutory instruments naming public bodies who have to prepare Schemes. Neither the 1993 Act nor secondary legislation made under it covers the private sector, although some organisations, notably banks and some railway companies, provide some of their information in Welsh. The measure requires public bodies and some private companies to provide services in Welsh. The Welsh government's Minister for Heritage at the time, Alun Ffred Jones, said, "The Welsh language is a source of great pride for the people of Wales, whether they speak it or not, and I am delighted that this measure has now become law. I am very proud to have steered legislation through the Assembly which confirms the official status of the Welsh language; which creates a strong advocate for Welsh speakers and will improve the quality and quantity of services available through the medium of Welsh. I believe that everyone who wants to access services in the Welsh language should be able to do so, and that is what this government has worked towards. This legislation is an important and historic step forward for the language, its speakers and for the nation." The measure was not welcomed warmly by all supporters: Bethan Williams, chairperson of the Welsh Language Society, gave a mixed response to the move, saying, "Through this measure we have won official status for the language and that has been warmly welcomed. But there was a core principle missing in the law passed by the Assembly before Christmas. It doesn't give language rights to the people of Wales in every aspect of their lives. Despite that, an amendment to that effect was supported by 18 Assembly Members from three different parties, and that was a significant step forward." On 5 October 2011, Meri Huws, Chair of the Welsh Language Board, was appointed the new Welsh Language Commissioner. She released a statement that she was "delighted" to have been appointed to the "hugely important role", adding, "I look forward to working with the Welsh Government and organisations in Wales in developing the new system of standards. I will look to build on the good work that has been done by the Welsh Language Board and others to strengthen the Welsh language and ensure that it continues to thrive." First Minister Carwyn Jones said that Meri would act as a champion for the Welsh language, though some had concerns over her appointment: Plaid Cymru spokeswoman Bethan Jenkins said, "I have concerns about the transition from Meri Huws's role from the Welsh Language Board to the language commissioner, and I will be asking the Welsh government how this will be successfully managed. We must be sure that there is no conflict of interest, and that the Welsh Language Commissioner can demonstrate how she will offer the required fresh approach to this new role." Ms Huws started her role as the Welsh Language Commissioner on 1 April 2012. Local councils and the National Assembly for Wales use Welsh, issuing Welsh versions of their literature, to varying degrees. Most road signs in Wales are in English and Welsh. Since 2000, the teaching of Welsh has been compulsory in all schools in Wales up to age 16. That has had an effect in stabilising and reversing the decline in the language. It means, for example, that even the children of non-Welsh-speaking parents from elsewhere in the UK grow up with a knowledge of, or complete fluency in, the language. The wording on currency is only in English, except in the legend on Welsh pound coins dated 1985, 1990 and 1995, which circulate in all parts of the UK. The wording is Pleidiol wyf i'm gwlad, (Welsh for True am I to my country), and derives from the national anthem of Wales, Hen Wlad Fy Nhadau. Some shops employ bilingual signage. Welsh rarely appears on product packaging or instructions. The UK government has ratified the European Charter for Regional or Minority Languages in respect of Welsh. Bilingual road sign near Wrexham Central station. The language has greatly increased its prominence since the creation of the television channel S4C in November 1982, which until digital switchover in 2010 broadcast 70 per cent of Channel 4's programming along with a majority of Welsh language shows during peak viewing hours. The all-Welsh-language digital station S4C Digidol is available throughout Europe on satellite and online throughout the UK. Since the digital switchover was completed in South Wales on 31 March 2010, S4C Digidol became the main broadcasting channel and fully in Welsh. The main evening television news provided by the BBC in Welsh is available for download. There is also a Welsh-language radio station, BBC Radio Cymru, which was launched in 1977. The only Welsh-language national newspaper Y Cymro (The Welshman) was published weekly until 2017. There is no daily newspaper in Welsh. A daily newspaper called Y Byd (The World) was scheduled to be launched on 3 March 2008, but was scrapped, owing to poor sales of subscriptions and the Welsh Government deeming the publication not to meet the criteria necessary for the kind of public funding it needed to be rescued. There is a Welsh-language online news service which publishes news stories in Welsh called Golwg360 ("360 [degree] view"). The decade around 1840 was a period of great social upheaval in Wales, manifested in the Chartist movement. In 1839, 20,000 people marched on Newport, resulting in a riot when 20 people were killed by soldiers defending the Westgate Hotel, and the Rebecca Riots where tollbooths on turnpikes were systematically destroyed. This unrest brought the state of education in Wales to the attention of the English establishment since social reformers of the time considered education as a means of dealing with social ills. The Times newspaper was prominent among those who considered that the lack of education of the Welsh people was the root cause of most of the problems. In July 1846, three commissioners, R.R.W. Lingen, Jellynger C. Symons and H.R. Vaughan Johnson, were appointed to inquire into the state of education in Wales; the Commissioners were all Anglicans and thus presumed unsympathetic to the nonconformist majority in Wales. The Commissioners presented their report to the Government on 1 July 1847 in three large blue-bound volumes. This report quickly became known as the Treachery of the Blue Books (Brad y Llyfrau Gleision) since, apart from documenting the state of education in Wales, the Commissioners were also free with their comments disparaging the language, nonconformity, and the morals of the Welsh people in general. An immediate effect of the report was that ordinary Welsh people began to believe that the only way to get on in the world was through the medium of English, and an inferiority complex developed about the Welsh language whose effects have not yet been completely eradicated. The historian Professor Kenneth O. Morgan referred to the significance of the report and its consequences as "the Glencoe and the Amritsar of Welsh history". In the later 19th century, virtually all teaching in the schools of Wales was in English, even in areas where the pupils barely understood English. Some schools used the Welsh Not, a piece of wood, often bearing the letters "WN", which was hung around the neck of any pupil caught speaking Welsh. The pupil could pass it on to any schoolmate heard speaking Welsh, with the pupil wearing it at the end of the day being given a beating. One of the most famous Welsh-born pioneers of higher education in Wales was Sir Hugh Owen. He made great progress in the cause of education, and more especially the University College of Wales at Aberystwyth, of which he was chief founder. He has been credited[by whom?] with the Welsh Intermediate Education Act 1889 (52 & 53 Vict c 40), following which several new Welsh schools were built. The first was completed in 1894 and named Ysgol Syr Hugh Owen. Towards the beginning of the 20th century this policy slowly began to change, partly owing to the efforts of O.M. Edwards when he became chief inspector of schools for Wales in 1907. The Aberystwyth Welsh School (Ysgol Gymraeg Aberystwyth) was founded in 1939 by Sir Ifan ap Owen Edwards, the son of O.M. Edwards, as the first Welsh Primary School. The headteacher was Norah Isaac. Ysgol Gymraeg Aberystwyth is still a very successful school, and now there are Welsh-language primary schools all over the country. Ysgol Glan Clwyd was established in Rhyl in 1956 as the first Welsh-medium secondary school. Welsh is now widely used in education, with 101,345 children and young people in Wales receiving their education in Welsh medium schools in 2014/15, 65,460 in primary and 35,885 in secondary. 26 per cent of all schools in Wales are defined as Welsh medium schools, with a further 7.3 per cent offering some Welsh-medium instruction to pupils. 22 per cent of pupils are in schools in which Welsh is the primary language of instruction. Under the National Curriculum, it is compulsory that all students study Welsh up to the age of 16 as either a first or a second language. Some students choose to continue with their studies through the medium of Welsh for the completion of their A-levels as well as during their college years. All local education authorities in Wales have schools providing bilingual or Welsh-medium education. The remainder study Welsh as a second language in English-medium schools. Specialist teachers of Welsh called Athrawon Bro support the teaching of Welsh in the National Curriculum. Welsh is also taught in adult education classes. The Welsh Government has recently set up six centres of excellence in the teaching of Welsh for Adults, with centres in North Wales, Mid Wales, South West, Glamorgan, Gwent. and Cardiff. The ability to speak Welsh or to have Welsh as a qualification is desirable for certain career choices in Wales, such as teaching or customer service. All universities in Wales teach courses in the language, with many undergraduate and post-graduate degree programs offered in the medium of Welsh, ranging from law, modern languages, social sciences, and also other sciences such as biological sciences. Aberystwyth, Cardiff, Bangor, and Swansea have all had chairs in Welsh since their virtual establishment, and all their schools of Welsh are successful centres for the study of the Welsh language and its literature, offering a BA in Welsh as well as post-graduate courses. At all Welsh universities and the Open University, students have the right to submit assessed work and sit exams in Welsh even if the course was taught in English (usually the only exception is where the course requires demonstrating proficiency in another language). Following a commitment made in the One Wales coalition government between Labour and Plaid Cymru, the Coleg Cymraeg Cenedlaethol (Welsh Language National College) was established. The purpose of the federal structured college, spread out between all the universities of Wales, is to provide and also advance Welsh medium courses and Welsh medium scholarship and research in Welsh universities. There is also a Welsh-medium academic journal called Gwerddon ("Oasis"), which is a platform for academic research in Welsh and is published quarterly. There have been calls for more teaching of Welsh in English-medium schools. Like many of the world's languages, the Welsh language has seen an increased use and presence on the internet, ranging from formal lists of terminology in a variety of fields to Welsh language interfaces for Windows 7, Microsoft Windows XP, Vista, Microsoft Office, LibreOffice, OpenOffice.org, Mozilla Firefox and a variety of Linux distributions, and on-line services to blogs kept in Welsh. Wikipedia has had a Welsh version since July 2003 and Facebook since 2009. In 2006 the Welsh Language Board launched a free software pack which enabled the use of SMS predictive text in Welsh. At the National Eisteddfod of Wales 2009, a further announcement was made by the Welsh Language Board that the mobile phone company Samsung was to work with the network provider Orange to provide the first mobile phone in the Welsh language, with the interface and the T9 dictionary on the Samsung S5600 available in the Welsh language. The model, available with the Welsh language interface, has been available since 1 September 2009, with plans to introduce it on other networks. On Android devices, both the built-in Google Keyboard and user-created keyboards can be used. iOS devices have fully supported the Welsh language since the release of iOS 8 in September 2014. Users can switch their device to Welsh to access apps that are available in Welsh. Date and time on iOS is also localised, as shown by the built-in Calendar application, as well as certain third party apps that have been localized. Secure communications are often difficult to achieve in wartime. Cryptography can be used to protect messages, but codes can be broken. Therefore, lesser-known languages are sometimes encoded, so that even if the code is broken, the message is still in a language few people know. For example, Navajo code talkers were used by the United States military during World War II. Similarly, the Royal Welch Fusiliers, a Welsh regiment serving in Bosnia, used Welsh for emergency communications that needed to be secure. It has been reported that Welsh speakers from Wales and from Patagonia fought on both sides in the Falklands War. In 2017, parliamentary rules were amended to allow the use of Welsh when the Welsh Grand Committee meets at Westminster. The change did not alter the rules about debates within the House of Commons, where only English can be used. In February 2018, Welsh was first used when the Welsh Secretary, Alun Cairns, delivered his welcoming speech at a sitting of the committee. He said, "I am proud to be using the language I grew up speaking, which is not only important to me, my family and the communities Welsh MPs represent, but is also an integral part of Welsh history and culture". In November 2008, the Welsh language was used at a meeting of the European Union's Council of Ministers for the first time. The Heritage Minister Alun Ffred Jones addressed his audience in Welsh and his words were interpreted into the EU's 23 official languages. The official use of the language followed years of campaigning. Jones said "In the UK we have one of the world's major languages, English, as the mother tongue of many. But there is a diversity of languages within our islands. I am proud to be speaking to you in one of the oldest of these, Welsh, the language of Wales." He described the breakthrough as "more than [merely] symbolic" saying "Welsh might be one of the oldest languages to be used in the UK, but it remains one of the most vibrant. Our literature, our arts, our festivals, our great tradition of song all find expression through our language. And this is a powerful demonstration of how our culture, the very essence of who we are, is expressed through language." A greeting in Welsh is one of the 55 languages included on the Voyager Golden Record chosen to be representative of Earth in NASA's Voyager program launched in 1977. The greetings are unique to each language, with the Welsh greeting being Iechyd da i chwi yn awr ac yn oesoedd, which translates into English as "Good health to you now and forever". Welsh vocabulary draws mainly from original Brittonic words (wy "egg", carreg "stone"), with some loans from Latin (ffenestr "window" < Latin fenestra, gwin "wine" < Latin vinum), and English (silff "shelf", giât "gate"). The phonology of Welsh includes a number of sounds that do not occur in English and are typologically rare in European languages. The voiceless alveolar lateral fricative [ɬ], the voiceless nasals [m̥], [n̥] and [ŋ̊], and the voiceless alveolar trill [r̥] are distinctive features of the Welsh language. Stress usually falls on the penultimate syllable in polysyllabic words, and the word-final unstressed syllable receives a higher pitch than the stressed syllable. In contrast to English practice, "w" and "y" are considered vowel letters in Welsh along with "a", "e", "i", "o" and "u". The letter "j" was not used traditionally, but is now used in many everyday words borrowed from English, like jam, jôc "joke" and garej "garage". The letters "k", "q", "v", "x", and "z" are used in some technical terms, like kilogram, volt and zero, but in all cases can be, and often are, replaced by Welsh letters: cilogram, folt and sero. The letter "k" was in common use until the 16th century, but was dropped at the time of the publication of the New Testament in Welsh, as William Salesbury explained: "C for K, because the printers have not so many as the Welsh requireth". This change was not popular at the time. The most common diacritic is the circumflex, which disambiguates long vowels, most often in the case of homographs, where the vowel is short in one word and long in the other: e.g. man "place" vs mân "fine", "small". Welsh morphology has much in common with that of the other modern Insular Celtic languages, such as the use of initial consonant mutations and of so-called "conjugated prepositions" (prepositions that fuse with the personal pronouns that are their object). Welsh nouns belong to one of two grammatical genders, masculine and feminine, but they are not inflected for case. Welsh has a variety of different endings and other methods to indicate the plural, and two endings to indicate the singular (technically the singulative) of some nouns. In spoken Welsh, verbal features are indicated primarily by the use of auxiliary verbs rather than by the inflection of the main verb. In literary Welsh, on the other hand, inflection of the main verb is usual. The canonical word order in Welsh is verb–subject–object (VSO). Siân is going to Llanelli. There, mae is a third-person singular present indicative form of bod, and mynd is the verbnoun meaning "to go". The imperfect is constructed in a similar manner, as are the periphrastic forms of the future and conditional tenses. In the preterite, future and conditional mood tenses, there are inflected forms of all verbs, which are used in the written language. However, speech now more commonly uses the verbnoun together with an inflected form of gwneud ("do"), so "I went" can be Mi es i or Mi wnes i fynd ("I did go"). Mi is an example of a preverbal particle; such particles are common in Welsh, though less so in the spoken language. Welsh lacks separate pronouns for constructing subordinate clauses; instead, special verb forms or relative pronouns that appear identical to some preverbal particles are used. The Welsh for "I like Rhodri" is Dw i'n hoffi Rhodri (word for word, "am I in [the] liking [of] Rhodri"), with Rhodri in a possessive relationship with hoffi. With personal pronouns, the possessive form of the personal pronoun is used, as in "I like him": [Dw i'n ei hoffi], literally, "am I his liking" – "I like you" is [Dw i'n dy hoffi] ("am I your liking"). Very informally, the pronouns are often heard in their normal subject/object form and aping English word order: Dw i'n hoffi ti ("Am I liking you"). In colloquial Welsh, possessive pronouns, whether they are used to mean "my", "your", etc. or to indicate the direct object of a verbnoun, are commonly reinforced by the use of the corresponding personal pronoun after the noun or verbnoun: ei dŷ e "his house" (literally "his house of him"), Dw i'n dy hoffi di "I like you" ("I am [engaged in the action of] your liking of you"), etc. It should be noted that the "reinforcement" (or, simply, "redoubling") adds no emphasis in the colloquial register. While the possessive pronoun alone may be used, especially in more formal registers, as shown above, it is considered incorrect to use only the personal pronoun. Such usage is nevertheless sometimes heard in very colloquial speech, mainly among young speakers: Ble 'dyn ni'n mynd? Tŷ ti neu dŷ fi? ("Where are we going? Your house or my house?"). The traditional counting system used in the Welsh language is vigesimal, i.e. it is based on twenties, as in standard French numbers 70 (soixante-dix, literally "sixty-ten") to 99 (quatre-vingt-dix-neuf, literally "four score nineteen"). Welsh numbers from 11 to 14 are "x on ten" (e.g. un ar ddeg: 11), 16 to 19 are "x on fifteen" (e.g. un ar bymtheg: 16), though 18 is deunaw, "two nines"; numbers from 21 to 39 are "1–19 on twenty"(e.g. deg ar hugain: 30), 40 is deugain "two twenties", 60 is trigain "three twenties", etc. This form continues to be used, especially by older people, and it is obligatory in certain circumstances (such as telling the time, and in ordinal numbers). There is also a decimal counting system, which has become relatively widely used, though less so in giving the time, ages, and dates (it features no ordinal numbers). This system is in especially common use in schools due to its simplicity, and in Patagonian Welsh. Whereas 39 in the vigesimal system is pedwar ar bymtheg ar hugain ("four on fifteen on twenty") or even deugain namyn un ("two score minus one"), in the decimal system it is tri deg naw ("three tens nine"). Although there is only one word for "one" (un), it triggers the soft mutation (treiglad meddal) of feminine nouns, where possible, other than those beginning with "ll" or "rh". There are separate masculine and feminine forms of the numbers "two" (dau and dwy), "three" (tri and tair) and "four" (pedwar and pedair), which must agree with the grammatical gender of the objects being counted. The objects being counted appear in the singular, not plural form. Currently, there is no standardised or definitive form of the Welsh language, with significant differences in dialect marked in pronunciation, vocabulary and in points of grammar. For example: consider the question "Do you want a cuppa [a cup of tea]?" In Gwynedd this would typically be Dach chi isio panad? while in Glamorgan one would be more likely to hear Ych chi'n moyn dishgled? (though in other parts of the South one would not be surprised to hear Ych chi isie paned? as well, among other possibilities). An example of a pronunciation difference is the tendency in some southern dialects to palatalise the letter "s", e.g. mis (Welsh for month), usually pronounced IPA: [miːs], but as IPA: [miːʃ] in parts of the south. This normally occurs next to a high front vowel like /i/, although exceptions include the pronunciation of sut "how" as IPA: [ʃʊd] in the southern dialects (compared with northern IPA: [sɨt]). A fifth 'language' is Patagonian Welsh, which has developed since the start of Y Wladfa (the Welsh settlement in Argentina) in 1865; it includes Spanish loanwords and terms for local features, but a survey in the 1970s showed that the language in Patagonia is consistent throughout the lower Chubut valley and in the Andes. Dialectal classifications exist within the 'languages' (such as the Cofi dialect). The book Cymraeg, Cymrâg, Cymrêg: Cyflwyno'r Tafodieithoedd (Welsh for Welsh, Welsh, Welsh: Introducing the Dialects) was accompanied by a cassette containing recordings of fourteen different speakers demonstrating aspects of different area dialects. The book also refers to the earlier Linguistic Geography of Wales as describing six different regions which could be identified as having words specific to those regions. In the 1970s, there was an attempt to standardise the Welsh language by teaching Cymraeg Byw ("Living Welsh") – a colloquially-based generic form of Welsh. But the attempt largely failed because it did not encompass the regional differences used by speakers of Welsh. Amongst the characteristics of the literary, as against the spoken, language are a higher dependence on inflected verb forms, different usage of some of the tenses, less frequent use of pronouns (since the information is usually conveyed in the verb/preposition inflections) and a much lesser tendency to substitute English loanwords for native Welsh words. In addition, more archaic pronouns and forms of mutation may be observed in Literary Welsh. They'll sleep only when there's a need. Ni chysgant ond pan fo angen. Fyddan nhw'n cysgu ddim ond pan fydd angen. The differences between dialects of modern spoken Welsh pale into insignificance compared to the difference between some forms of the spoken language and the most formal constructions of the literary language. The latter is considerably more conservative and is the language used in Welsh translations of the Bible, amongst other things - although the 2004 Beibl Cymraeg Newydd (Welsh for New Welsh Bible) is significantly less formal than the traditional 1588 Bible. Gareth King, author of a popular Welsh grammar, observes that "The difference between these two is much greater than between the virtually identical colloquial and literary forms of English". A grammar of Literary Welsh can be found in A Grammar of Welsh by Stephen J. Williams or more completely in Gramadeg y Gymraeg by Peter Wynn Thomas. (No comprehensive grammar of formal literary Welsh exists in English.) An English-language guide to colloquial Welsh forms and register and dialect differences is Dweud Eich Dweud by Ceri Jones. ^ Jones, Hywel M (February 2012). "A statistical overview of the Welsh language" (PDF). Cardiff: Welsh Language Board. p. 115. Archived from the original (PDF) on 30 March 2012. Retrieved 28 March 2016. ^ "Welsh speakers by local authority, gender and detailed age groups, 2011 Census". statswales.gov.wales. 11 December 2012. Retrieved 22 May 2016. ^ "Data Viewer – Nomis – Official Labour Market Statistics". www.nomisweb.co.uk. ^ "Wales and Patagonia". Wales.com - The official gateway to Wales. Welsh Government. Retrieved 22 May 2016. Today the province of Chubut, where most Welsh immigrants settled, has a population of 550,000 people. Of these, some 50,000 can claim Welsh ancestry and 5,000 speak the Welsh language. ^ "Population of immigrant mother tongue families, showing main languages comprising each family, Canada, 2011". Statistics Canada. Retrieved 21 August 2017. ^ Hammarström, Harald; Forkel, Robert; Haspelmath, Martin, eds. (2017). "Welsh". Glottolog 3.0. Jena, Germany: Max Planck Institute for the Science of Human History. ^ Edwards, Huw. "Why do they speak Welsh in South America?". BBC iWonder. BBC. Retrieved 16 September 2017. ^ Nolan, Edward Henry (1859). Great Britain As It Is. London: John Lane & Co. p. 47. Retrieved 10 September 2018. ^ Jackson, John (1752). Chronological Antiquities. Volume III. London: J Noon. p. 143. ^ Statistician, Chief (27 March 2019). "Chief Statistician's update: a discussion about the Welsh language data from the Annual Population Survey". Digital and Data Blog. Retrieved 27 March 2019. ^ "Welsh Language (Wales) Measure 2011". legislation.gov.uk. The National Archives. Retrieved 30 May 2016. The Welsh language has official status in Wales. ^ "National Assembly for Wales (Official Languages) Act 2012". www.legislation.gov.uk. The National Archives. Retrieved 19 April 2018. The official languages of the Assembly are English and Welsh. ^ Charles-Edwards, Thomas M (2013). "2: Britons and their Languages". Wales and the Britons, 350–1064 (1st ed.). Oxford University Press. p. 75. ISBN 978-0-19-821731-2. OCLC 823319671. ^ a b c d e f Koch, John T. (2006). Celtic Culture: A Historical Encyclopedia. Santa Barbara: ABC-CLIO. p. 1757. ISBN 9781851094400. OCLC 266510465. ^ a b Janet, Davies (15 January 2014). The Welsh Language: A History. Cardiff: University of Wales Press. ISBN 978-1-78316-019-8. OCLC 878137213. ^ Higham, Nicholas (1 April 2014). "T. M. Charles-Edwards. Wales and the Britons, 350–1064". The American Historical Review. 119 (2): 578–579. doi:10.1093/ahr/119.2.578. ISSN 0002-8762. ^ Jenkins, Simon (2008). Wales: Churches, Houses, Castles. Allen Lane. p. 244. ISBN 9780141024127. OCLC 751732135. ^ Prys-Jones, Arthur G. (1955). Gerald of Wales. London: George G. Harrap and Co. p. 125. OCLC 562036518. ^ Llŷr, Dylan (20 August 2013). "Is Welsh the oldest language?". Why Welsh?. Retrieved 10 September 2018. ^ "The Industrial Revolution". Wales History. BBC. Retrieved 30 December 2011. ^ Morris, Steven (18 December 2017). "Wales launches strategy to double number of Welsh speakers by 2050". The Guardian. Guardian Media Group. Retrieved 25 February 2019. ^ "'Encouraging' survey suggests rise in Welsh language speakers". BBC News. BBC News Online. 22 September 2018. Retrieved 25 February 2019. ^ "2004 Welsh Language Use Survey: the report" (PDF). Archived from the original (PDF) on 27 April 2012. Retrieved 5 June 2012. ^ "2011 Census: Number of Welsh speakers falling". BBC. Retrieved 12 December 2012. ^ "Welsh Government | Welsh language use survey". gov.wales. Retrieved 7 June 2017. ^ Green, David W.; Wei, Li (November 2016). "Code-switching and language control". Bilingualism: Language and Cognition. 19 (5): 883–884. doi:10.1017/S1366728916000018. ^ "Welsh speakers by local authority, gender and detailed age groups, 2011 census". Welsh Government. Welsh Government. Retrieved 25 February 2019. ^ "Nigel Callaghan (1993). More Welsh Speakers than Previously Believed (on-line). Accessed 21 March 2010". Retrieved 23 May 2010. ^ "Estimation of the number of Welsh speakers in England" (PDF). Archived from the original (PDF) on 30 March 2012. Retrieved 27 February 2014. ^ a b "QS204EW – Main language (detailed)". Nomis Official Labour Market Statistics. ^ "2011 Census Glossary of Terms" (PDF). Office For National Statistics. ^ "2011 Census Questionnaire for England" (PDF). Office for National Statistics. Retrieved 6 June 2017. ^ "Data Viewer – Nomis – Official Labour Market Statistics". www.nomisweb.co.uk. Retrieved 23 November 2017. ^ Bureau, US Census. "Detailed Languages Spoken at Home and Ability to Speak English". www.census.gov. Retrieved 4 April 2018. ^ "Croeso i HSBC yng Nghymru" [Welcome to HSBC in Wales]. HSBC Bank (in Welsh). Retrieved 10 September 2018. ^ "Eich cysylltu â'r hyn sy'n bwysig" [Connecting you to what's important]. Arriva Trains Wales (in Welsh). Archived from the original on 11 November 2018. Retrieved 10 September 2018. ^ "Proposed Welsh Language (Wales) Measure [As Passed] Accessed 12 September 2016" (PDF). assembly.wales. ^ "'Historic' vote for language law". BBC News. BBC. 7 December 2010. Retrieved 10 September 2018. A new law to promote the Welsh language has been unanimously passed by the Welsh Assembly. The measure makes Welsh an official language in Wales, and obliges public bodies and some private companies to provide services in it. A language commissioner will be appointed to enforce the measure and to protect the Welsh speakers' rights. Ministers hailed the vote as a "historic step forward for the Welsh language." ^ a b "Welsh Government – Welsh Measure received Royal Assent". Archived from the original on 22 September 2013. ^ "Royal Assent for official status of Welsh language". Wales Online. Cardiff: Trinity Mirror. 12 February 2011. Retrieved 10 September 2018. Powers confirming the official status of Welsh received Royal Assent yesterday. The Welsh Language Measure will create the post of language commissioner and ensure services can be provided in Welsh. ^ "Language board chief Meri Huws is Welsh commissioner". BBC News. BBC. 5 October 2011. Retrieved 10 September 2018. The chairwoman of the Welsh Language Board has been appointed the first Welsh language commissioner. Meri Huws will act as a champion for the Welsh language, says First Minister Carwyn Jones. ^ "Current school curriculum". Welsh Government. Welsh Government. Retrieved 25 February 2019. ^ "List of declarations made with respect to treaty No. 148". Conventions.coe.int. Retrieved 23 May 2010. ^ BBC website (Real Media). ^ Conboy, Martin (2010). Journalism in Britain: A Historical Introduction. SAGE Publications. p. 188. ISBN 978-1-4462-0972-1. ^ "Daily Welsh newspaper abandoned". BBC News. 15 February 2008. ^ "'Treacherous' Blue Books online". BBC News. BBC. 23 December 2005. Retrieved 21 January 2017. A 19th Century report that became controversial for condemning the Welsh language has been published online by the National Library of Wales. The government report about Welsh education in 1847 was dubbed the Treachery of the Blue Books (Brad y Llyfrau Gleision). ^ Davies, John (1993). A History of Wales. London: Penguin Books. ISBN 978-0-14-014581-6. OCLC 925144917. ^ "Ysgol Gymraeg Aberystwyth celebrates 75th anniversary". BBC News. BBC. 25 September 2014. Retrieved 3 October 2016. Former pupils and teachers of Wales' first Welsh-medium school will gather to celebrate its 75th anniversary. Ysgol Gymraeg Aberystwyth was opened in September 1939 by Sir Ifan ab Owen Edwards, who feared children's spoken Welsh was being tarnished by the English language. ^ "Welcome". Ysgol Glan Clwyd. Archived from the original on 5 October 2016. Retrieved 3 October 2016. The school was established in 1956 and was the first Welsh-medium secondary school in Wales. It was originally located in Rhyl. ^ "Schools by local authority, region and Welsh medium type". Stats Wales. Stats Wales. ^ "5-year Report". Welsh Language Commissioner. Welsh Language Commissioner. Archived from the original on 23 September 2016. ^ "The Welsh language". Citizens Advice. Archived from the original on 18 July 2012. Retrieved 27 February 2014. Welsh is a subject in the national curriculum and is compulsory at all state schools in Wales, for pupils up to the age of 16. In English-medium schools, it is taught as a second language, and in Welsh-medium schools, as the first language. ^ "Welsh medium or bilingual provision". bwrdd-yr-iaith.org.uk. Welsh Language Board. Archived from the original on 4 October 2007. ^ The Welsh National Database of Standardised Terminology was released in March 2006 Archived 25 September 2006 at the Wayback Machine. ^ Selections of Welsh-language blogs are listed on the sites Hedyn and Blogiadur. ^ "Celular News webpage". Cellular-news.com. 11 August 2006. Retrieved 27 February 2014. ^ "Mobile phone for Welsh-speakers". BBC News. 4 August 2009. Retrieved 23 May 2010. ^ "LiterIM external keyboard for Android". Troi.org. Retrieved 27 February 2014. ^ "Free Welsh Localization for iOS Developers". Applingua. 6 March 2015. Retrieved 23 May 2010. ^ "Apps in Welsh Directory". Apps in Welsh. 29 October 2015. Retrieved 23 May 2010. ^ Heath, Tony (26 August 1996). "Welsh speak up for their ancient tongue". The Independent. p. 6. ^ Hope, Christopher (20 June 2012). "Argentina turns to Wales for help with Falkland Islands". The Daily Telegraph. Retrieved 21 January 2016. ^ "Welsh language to be allowed in MPs' Welsh Grand Committee". BBC News. BBC. 22 February 2017. Retrieved 8 February 2018. ^ "MPs speak Welsh in parliamentary debate for first time". BBC News. BBC. 7 February 2018. Retrieved 8 February 2018. ^ Williamson, David (7 February 2018). "A historic first for Welsh at Westminster as language officially used for first time". dailypost.co.uk. ^ Williamson, David (7 February 2018). "MPs use first ever bilingual debate in Westminster". WalesOnline. ^ David Williamson. "Walesonline.co.uk". Walesonline.co.uk. Retrieved 23 May 2010. ^ "Greetings to the Universe in 55 Different Languages". NASA. Retrieved 10 May 2009. ^ "Welsh greetings". NASA. Retrieved 10 May 2009. ^ WalesOnline (10 June 2011). "The Welsh message hurtling through space 10 billion miles from its home". ^ Thomas, Peter Wynn (1996) Gramadeg y Gymraeg. Cardiff: University of Wales Press: 757. ^ "English and Welsh, an essay by J. R. R. Tolkien" (PDF). typepad.com. ^ "Index to Welsh dialects". Kimkat.org. 20 April 2006. Retrieved 27 February 2014. ^ Thomas, Beth; Thomas, Peter Wynn (1989). Cymraeg, Cymrâg, Cymrêg: Cyflwyno'r Tafodieithoedd [Welsh, Welsh, Welsh: Introducing the Dialects] (in Welsh). Gwasg Taf. ISBN 978-0-948469-14-5. ^ Thomas, Alan R (1973). Linguistic Geography of Wales. Cardiff: University of Wales Press for Board of Celtic Studies. ^ "Teach Yourself Welsh". Cymdeithas Madog. 15 March 2000. Retrieved 25 March 2014. ^ Klingebiel, Kathryn (1994). 234 Welsh Verbs: Standard Literary Forms. Belmont, Massachusetts: Ford & Bailie. p. 223. ISBN 978-0-926689-04-6. ^ King, Gareth (2016). Modern Welsh: A Comprehensive Grammar (3rd ed.). Abingdon: Routledge. p. 3. ISBN 978-1-138-82629-8. ^ Williams, Stephen J (1980). A Welsh Grammar. Cardiff: University of Wales Press. ISBN 978-0-7083-0735-9. ^ Thomas, Peter Wynn (1996). Gramadeg y Gymraeg. Cardiff: University of Wales Press. ISBN 978-0-7083-1345-9. ^ Jones, Ceri (2013). Dweud Eich Dweud: A Guide to Colloquial and Idiomatic Welsh. Llandysul: Gomer Press. ISBN 978-1-84851-748-6. Welsh Language (Wales) Measure 2011: available in Welsh and **English. Scottish Gaelic or Scots Gaelic, sometimes also referred to simply as Gaelic, is a member of the Goidelic (Gaelic) language branch of the Celtic languages native to the Gaels of Scotland. A member of the Goidelic branch of the Celtic languages, Scottish Gaelic, like Modern Irish and Manx, developed out of Middle Irish. Most of modern Scotland was once Gaelic-speaking, as evidenced especially by Gaelic-language placenames. Llandaff is a district, community and coterminous electoral ward in the north of Cardiff, capital of Wales. It was incorporated into the city in 1922. It is the seat of the Bishop of Llandaff, whose diocese within the Church in Wales covers the most populous area of South Wales. The Welsh Language Society is a direct action pressure group in Wales campaigning for the right of Welsh people to use the Welsh language in every aspect of their lives. The current Chairperson of Cymdeithas yr Iaith Gymraeg is Heledd Gwyndaf. Grangetown is a district and community in the south of Cardiff, capital of Wales. It is one of the largest districts in the south of the city and is bordered by Riverside, Canton and Butetown. The River Taff winds its way through the area. Adjacent to the city's Cardiff Bay area, Grangetown is benefitting from the nearby developments and is experiencing a period of gentrification and improvements in its infrastructure. Its population as of 2011 was 19,385 in 8,261 households. One of the "five towns of Cardiff", the others are Butetown, Crockherbtown, Newtown and Temperance Town. Patagonian Welsh is the name given to the Welsh language as spoken in Y Wladfa, the Welsh settlement in Patagonia, Argentina, specifically in the province of Chubut. Ysgol Gyfun Gymraeg Glantaf is a Welsh-medium coeducational secondary school in Llandaff North, a district in the north of Cardiff, Wales and is the largest of its kind in the country. The name 'Glantaf' means 'The bank of the river Taf' in Welsh. Of the three Welsh-medium secondary schools serving Cardiff, it was the first to be established. Although all students speak Welsh and normally have received Welsh-language primary education, 68% come from homes where Welsh is not the first language. Education delivered through the medium of the Welsh language is known as Welsh-medium education . The two official languages of Wales are Welsh and English. Both languages are constituted as working languages of the National Assembly, however Welsh is further recognised in law as having "official status", making it the sole de jure official language in any part of the United Kingdom. The majority of the population of Wales is able to speak English, while Welsh is spoken by almost one-third of the population.